I won’t give the history of The Large Glass, or The Bride Stripped Bare by her Bachelors, Even, considered by some to be Marcel Duchamp’s masterpiece. You can hit the link and read the Wikipedia article on it, if you wish. 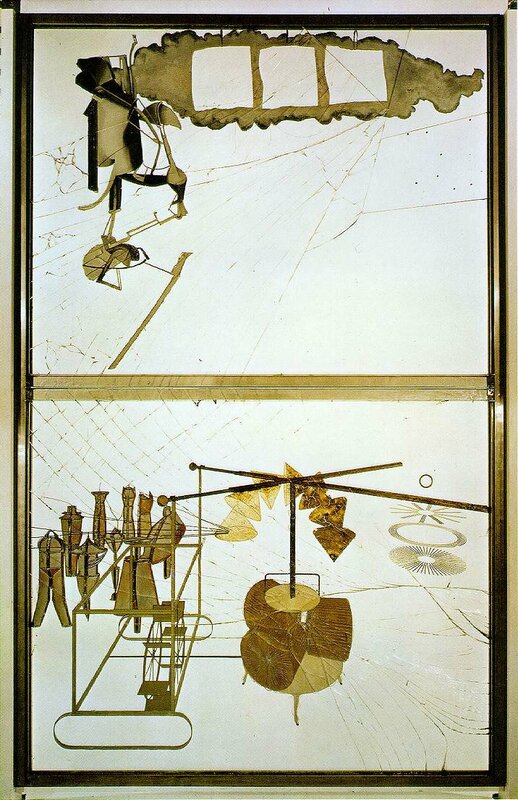 I’ll only say it took Duchamp 8 years to complete (1915-1923) and after a showing in Brooklyn in 1926 it broke, and Duchamp carefully repaired it by glueing the glass pieces back into place. The work sits now, a delicate spiderweb of cracks in two plates of glass set over lead wire and oil and paint, in the Philadelphia Museum of Art, which is where Duchamp patron Walter Arensberg convinced him to leave his entire collection upon his death. I have yet to get (though I will) to the museum to see the work of the man who is without a doubt my favourite artist and is, in terms of influence, as important to the evolution and advancement of 20th century art as Picasso and Matisse. He single-handedly created conceptual art, and anticipated every major art movement of the 20th century, and even the 21st. I have seen a replica by Richard Hamilton in the Tate Modern. Duchamp approved three of these replicas in 1961, located now in London, Stockholm, and Tokyo, and seeing just the replicated piece in the Modern was a mystical experience for me. I was trembling as I approached it, and overawed by its power as I stood before it for an hour. Strange that a piece of art, by a single artist, could have this effect on me. Especially one was strange and inscrutable as The Large Glass. Calvin Tomkin’s brilliant and incomparable biography, titled Marcel Duchamp, had the same mystical effect when I read it in 2005, and I wondered, since Duchamp died the year I was born, if I had not inherited a piece of his soul? Alas, he died in October and I was born ten months earlier in January. My friend Daryn, who tends to be dismissive of most twentieth century art in favour of his own, also considers Duchamp to be one of the most important artists of the period. Duchamp has, for range of inventiveness and output and sheer intelligence, often been compared to Da Vinci. It has also been said that, along with Da Vinci and Socrates, he was one of the most brilliant men to have ever lived. The image below is from the original work, and you can clearly see the cracks. I said yesterday in my Bill Evan’s post that the talking in the recording at the Village Vanguard enhanced the albums cut from it; so do, then, the inadvertent cracks add to the mystique and power of The Large Glass. Even Duchamp himself thought so; he was a champion of inadvertent art long before The Large Glass was broken and repaired.